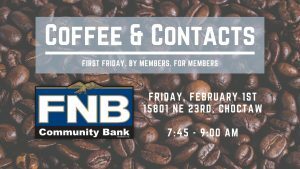 Join us for our first-ever membership networking event, hosted by FNB Community Bank (Choctaw Branch)! This come-and-go event will take place on the first Friday of every month, at a different member’s office. This is a time for you to network with other chamber members. Join us on 2/1, and help us spread the word!